Duffield Castle is a late 11th century earthwork motte and bailey fortress, founded by Henry de Ferrers. 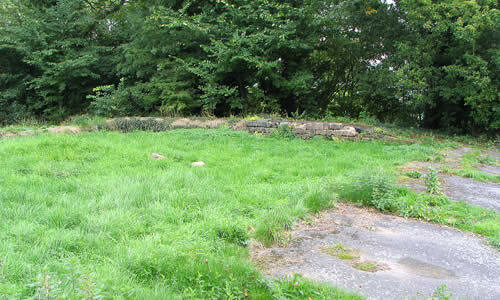 Standing on a prominent knoll, the motte is encased by a wide ditch and its western bailey was defined by two ditches. The earthwork castle was destroyed in 1173 but in the late 12th century William de Ferrers crowned the motte with a large stone keep, a forebuilding and a deep well. In 1266 during the Montfortian rebellion, Robert de Ferrers was captured by the forces of Prince Henry, nephew of King Henry III and his keep was demolished. Later some of its materials were used to construct a small 13th century building, on the site. Sadly the bailey has been built over and the keep's remaining sandstone ashlar walls have been topped with tarmac. 3 miles south-east is Horston Castle and 9 miles north-east is Codnor Castle. Duffield Castle is located in the town centre, off Milford Road. 5 miles north of Derby, on the A6. The site is owned by The National Trust and is freely accessible in daylight hours, from Milford Road steep steps ascend the knoll.